In many blogs we had read during our small research on Dieng, people mentioned about the sunrise watched from Bukit Sikunir, a hill located in the highest village in Java. They said if we didn't see the sunrise, we hadn't completely seen Dieng. Waking up early in the morning, especially during holiday, was a real arduous task for me. But for the sake of watching the sunrise from the hill, I would set the alarm at 3.30AM. Despite the loud sound coming from the alarm, my sleep remained undistracted. Thanks to Irfan and Endah for waking me up that morning. We did the Morning Prayer and then waited for Pak Septanto to pick us up. Soon, we were down the road again. We found that we were not the only ones looking forward to watching the sunrise, as there was a long line of cars entering a village's gate. We were dropped off few meters before the parking ground and were told to hike a steep path nearby. In such a dark morning like that, we could only rely on the flashlight. We had to be extra careful with the ravine at one side and also the wet slippery path we had to walk through. It took us about 15 minutes to reach the point where we could watch the sun arose from behind the great mountains of Sumbing and Sindoro. It was amazing. I had never enjoyed taking pictures of sunrise like this before. I noticed that nearly all the spectators were young people – mostly Javanese speaking – considering that it took an enormous energy to hike the hill. As the sun moved higher, we walked down to the lower point where we could see a deforested valley. Potatoes which were in high demand in the market had slowly but sure affected environment. To me, walking down the hill was like twice harder than the walking up. It was a huge relief when we finally reached the parking ground. The plan was slightly changed. We returned to the temples we had seen earlier in the previous day instead of the hotel. This time we walked through the right entrance. Yet, we didn't pay for the ticket again as there was nobody in the front boot and the temples wasn't yet open for public. We were fortunate I guessed. I found the temple more pleasant when there was no one around. It was so silent that I was able to see the link between the temple and its history as a sacred place for Hindus to contemplate. I took some shots before heading to the food stall that sold fried potatoes. As we got back in the hotel, we took a nap before getting ready for the Friday Prayer. Pak Septanto would pick us up after the prayer and drive us down to Wonosobo where we were going to take a bus home. At around 12 o’clock, Irfan and I woke up and walked to the mosque across the hotel for the prayer at noon. I was glad that the sermon was conveyed in Bahasa Indonesia instead of Javanese. After the prayer, we packed our belongings and were ready to check out from the hotel. I took a picture of the room we had stayed overnight. Pak Septanto came right on time. He was so generous he didn’t charge us more for the ride to Wonosobo. On the way down, I thanked God for the good weather during our stay in Dieng. 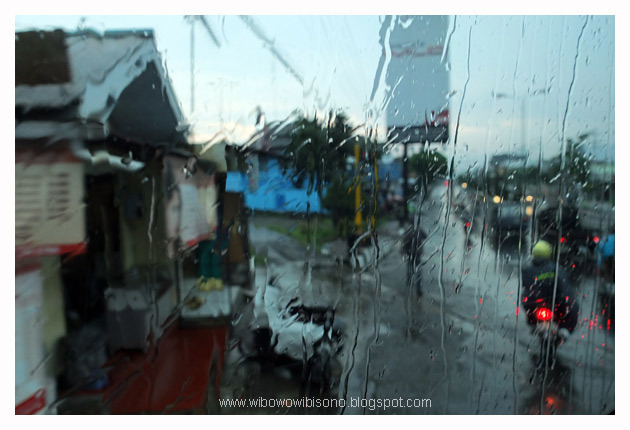 A heavy rain suddenly fell as we got closer to the town of Wonosobo, and that made the temperature get lower. Entering the town, we went straight to a famous small restaurant that served noodle soup – “Mie Ongklok” – as local culinary. 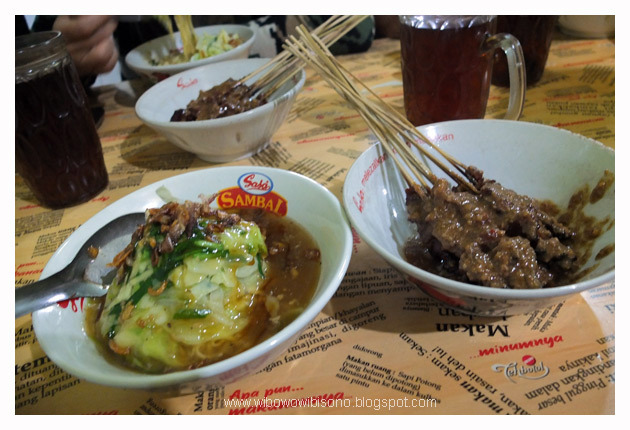 It was “Kios Mie Ongklok Pak Muhadi,” located on Jalan Ahmad Yani and was strongly recommended by Pak Septanto who was actually a native of Wonosobo. I guessed it was a perfect time for a hot noodle soup. It came with beef satay that tasted so good I wanted to crave for more and more. Finally, the time came for us to leave Wonosobo. Pak septanto took us around on a short tour of the town before dropping us off at the bus station. It was a lovely mountainous town. I told myself to return to this place one day. At around four in the afternoon, we got on board to the bus that would take us back to Jakarta. With the rain fell outside, I said good bye to the highland. Candi2nya mirip di kedung songo. Khas candi hindu ya?